Finding The Best Patch Cables For Pedalboards is easier than you think. There’s nothing worse than turning your amp on at a gig, only to find out there’s no sound coming from your guitar or pedal board. You’re running your guitar through your expensive pedal board setup and now you’ve got 10 minutes to hunt down & replace the one bad patch cable that’s ruining everything. Of course, this entire situation could have been avoided if you had the right patch cables in the first place. It turns out that some patch cables are just made poorly with cheap components. There’s nothing wrong with cheap cables really if you’re just going to be practicing at home and jamming by yourself, why not get some cheap cables? The stakes are not very high if you’re a bedroom musician and you have to diagnose some sound issues. However, if you’re a gigging musician, or even a studio session player then you’ve got to have the best patch cables for your pedal board. You require a rig that’s always up and running, because you can’t afford to miss a golden opportunity to perform just because your patch cables decide to fail. 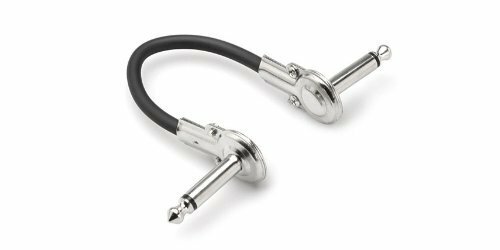 In our opinion, Hosa low-profile patch cables are the absolute best because of their slim design & proven track record. If you’re a complete pedal junkie, and need all the room you can get on your board, then Hosa’s are for you because you can place your pedals closer than ever thanks to the ‘pancake jacks’ on the ends of the cable. As you can see, the connectors on the Hosa cables are a ‘low-profile’ design so they don’t stick out as much as the bulkier right-angle patch cables that most companies manufacture. We’ve also found that the Hosa’s tend to fit extra snug into your pedal’s input. You can definitely feel the quality & heart that goes into each Hosa cable, which makes them an absolute treat to use on your pedal board. World’s Best Cables truly make the world’s best patch cables for pedal boards according to a lot of professional players. Like we’ve already said, the most important thing you can ask for out of your patch cable is reliability. 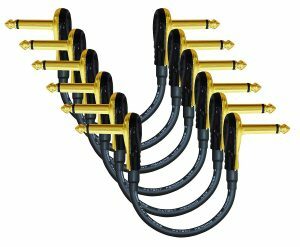 With gold plated tips and Mogami wire you’re looking at one of the most reliable cables on the market, and the high price tag reflects that fact. The gold plated tips also eliminate any added noise and preserve your tone better than most cables. 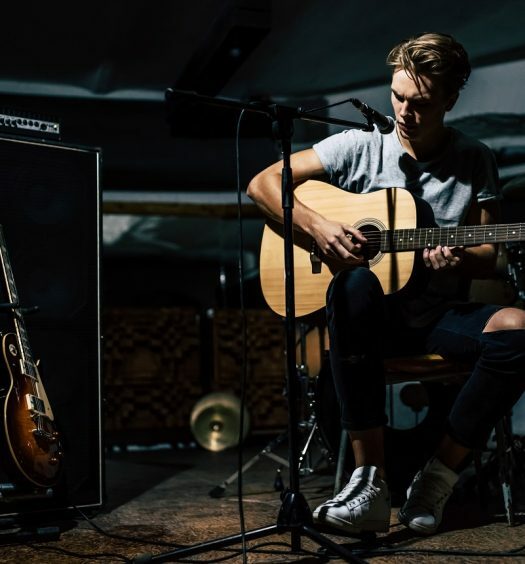 The high quality components removes any radio interference that may usually occur, and it also stops a particularity noisy pedal on your board from interfering with your solo. Donner Patch Cables are great to keep in your gig bag as backup cables in case you need a patch cable in a pinch. If you’re not a stickler for tone, and you just want the best value possible, then Donner has some of the cheapest most reliable patch cables in the business. The Donner cables are about the same price as the Hosa cables, but if you prefer this style of cable with the fatter heads rather than the slimmer heads, then the Donner’s are a great choice. Personally I carry about a dozen of these around in my back pack whenever I’m gigging, for the sole purpose of replacing a bad cable, in case I should notice any issues during soundcheck. 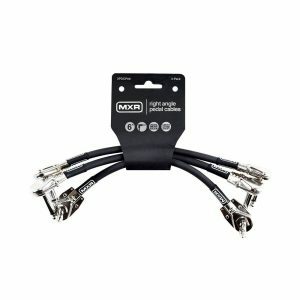 These MXR 3PDCP06 patch cables come in a 3-pack for the price of a Hosa 6-pack, but that’s a testament to the MXR cable’s quality and craftsmanship. It’s common to see reviewers commenting on the incredible durability of the cable heads on these particular patch cables. The low profile cable heads, like the Hosa’s, lend themselves to a tightly packed pedal board. Plus if you use a lot of MXR pedals, you get patch cables with that iconic MXR logo on them to match your pedals. 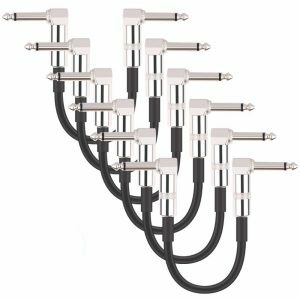 If you like branded cables, with standard connectors that are guaranteed for life, then look no further than these Fender patch cables. There’s not much more to say that we haven’t already covered regarding patch cables. But, if you use a Fender guitar or amp, and want cables to match your setup, then this is the way to go. The Fender Performance Series Instrument Patch Cables just feel extremely durable and worthy of their lifetime guarantee. If you use your patch cables properly, and don’t overstretch them, or kink them, then any of the patch cables on our list will make a great addition to your pedal-board. If you’re looking for a slimmer pancake jack style head then the Hosa, MXR, and World’s Best Cables are your best bet. If you just want a traditional patch cable with the fatter style connector then the Fender & Donner cables will get the job done.